Another day that I have to take a break from posting Jagoffs to pay tribute to an important person in my life. Elizabeth Wertz-Evans, died yesterday due to breast cancer that had metastasized into her liver. She was a great friend, boss, mentor and one of the most passionate/compassionate people I’ve ever known. Her personal drive and level of perseverance despite what life threw at her, was incredible. I’ve summarized some of what I believe made Liz one of the most incredible people whom I have known. Her drive to accrue personal and professional accomplishments was incredible and infectious. In the meantime, her compassion to care about an individual was equally incredible. She had endless energy, and passion and never took “no” for an answer. If you’re an Emergency Medical Services professional, you’ve been touched by her passion to create education regarding trauma patients, pediatric patients and, more specifically, special needs pediatric patients and may not even recognize it. A few weeks ago, I was lucky enough to walk with Liz and her family around the Shadyside Hospital perimeter during one of her admissions. On our walk, we passed two EMS trainee’s sitting outside the hospital. I thought, what a shame that, here she was.. the author of some of key parts of their curriculum… but they had no idea that this, now feeble woman, had such an impact on their training and future profession. While we all have things that occur in life that are tragic, Liz , in my opinion, had more than her fair share. And, when these events occurred, she always turned them into a cause for good. Shortly after her birth, Liz’ daughter Amanda developed a seizure disorder that became a life-long medical condition. Amanda became a child with special needs. Not only did Liz, and the rest of her family, take care of Amanda at home, she used this as an opportunity to create a training course for EMS professionals and teachers re: how to appropriately treat a child with special needs. There is now a Pennsylvania State EMS Award given to an EMS provider each year in Amanda’s name. 14 years into Amanda’s life, Amanda was hospitalized for a somewhat routine surgery. The one night that Liz did not stay at the hospital, went home to rest, a medical error caused Amanda to die. Liz was crushed as you can imagine. She adapted and moved forward using this opportunity to discuss medical errors to her peers and also to learn about Highmark’s Caring Place to help her, her husband Patrick and Amanda’s 2 siblings, grieve. They became strong advocates for The Caring Place. A little over a year after Amanda’s death, on the drive home from a Caring Place event to celebrate Amanda’s life, Liz’s husband and Amanda’s sister were in a car crash. Liz’s husband died on impact. Amanda’s sister survived but went through numerous surgeries and physical therapy sessions. Liz was there to manage all of it. She still did not lose her drive to educate and use what life threw at her as some type of teachable moment for others. Liz eventually remarried. Life was on a good track. A few years ago, Liz, was diagnosed with breast cancer. As you can imagine, it was another punch in the gut for her but, she continued to be positive. 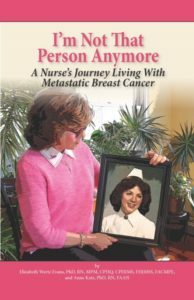 She looked for ways to educate others by authoring books, writing text book chapters and writing articles and advocating for changes in the patient experience. As a young paramedic, Liz took a chance and hired me to work in her EMS department waaaaay back when. I had no experience to do what she had hired me to do but she assured me that she had faith in me and basically held my hand the entire way. As her career progressed, she continued to open doors for me professionally. As changes occurred in each of our lives, we continued to adapt and maintain a close friendship. Liz held my hand, emotionally, through many of personal and professional changes over the years from job choices, date choices, child care, health care… you name it! 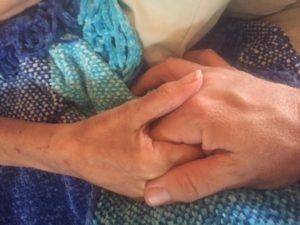 So, when given the opportunity to visit with her, last week, to talk about her impending death and say our goodbyes, my personal request was not to take a picture of our faces as something to remember, I requested that we take a photo of her holding my hand, one last time. She obliged. You were a fantastic mentor to many of us in our EMS careers AND personal lives. You will be missed…. but your impact on all of us will be forever. Please keep Liz’s family in your thoughts and prayers. A beautiful and heartfelt tribute to a woman that each of us would be fortunate to have holding our hand. You did good John. I’m sure she would be proud of your words and your expression of those thoughts. Thanks Robert for reading the post and the kind words. The challenge is mine now to step up my game to her standards. Liz has touched the lives of so many people. Her impact on the professional development of untold numbers is seen through the careers of so many that had the privilege to work with and learn from her. In our lives, there are many people that pass through it, but there are a few that make a lasting impact, Liz is one of the few. Very nice post John. Well said Jeff! Thanks for the kind words. Thank you for this great summary of Liz’s life. I first met her at AGH in the ER. We were meeting to talk about the EMS program she had put together. I also knew her through my best friend Sharon Peifer-Robinson. Their lives were intertwined and as a friend of Sharon’s I had many different opportunities to talk with Liz. I hadn’t seen her for years and one day I ran into her at a store we were both shopping in at the time. She immediately screamed and hugged me and said how great it was that we ran into each other. She was ok at that time. Not long after I was told that she had cancer and it had spread to her liver. While she was sick and going through chemotherapy, I was in the hospital in liver failure due to a fatty liver. I was very ill and almost died a number of times. Sharon would keep me informed of what was going on with Liz. Sharon was going back and forth between both of us. She was falling apart on the inside thinking she was going to lose two of her long life friends. I prayed often for Liz and for myself. Liz was an amazing person. She was so vibrant and full of life and had more energy than almost anyone I knew. She was non-stop on the go making things happen. It kind of made me nervous to be around her at AGH because I was afraid she would drag me into her whirlwind of activity and I wouldn’t be able to keep up with her. I was blessed to know her. I wish I had known her more than just someone who had come in and out of my life for years. She was exceptional. She went through too many horrible tragedies. She was successful in what she did. Now that she is gone it is clear that she touched the lives of many people in a good way and she was loved by all. That is her true legacy. Having the love of so many was her blessing and ours as well. Rest and God Bless you and be at His side.